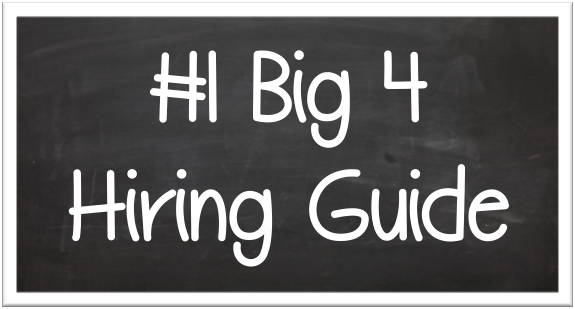 #1 Big 4 Accounting Firms Hiring Guide — Big 4 Guru - Get Hired By Big 4 Accounting Firms! Get the secret weapon. The #1 BEST SELLING Big 4 Accounting Firm Hiring Guide since '08! It was early April in my Junior year of college and I was having a bad day. I had forgotten to save a paper Id been working on and had watched helplessly as two hours of work vanished when my computer froze. There was no time to redo it because I was also running late for my part-time campus job. This assignment was just not going to get done. I ran quickly down the front steps of my college apartment, nearly falling on the invisible ice that lingered despite the shining sun. As I glanced up the steps to look at the ice something caught my eye: the mailbox was propped open. There was a large brown envelope inside and the lid wouldn't shut. Congratulations! We are pleased to offer you a summer internship position. My old Chevy Cavalier pulls into the cobblestone driveway of the most exclusive country club in town. Wearing my best (and only) suit, Im arriving at a reception for students who have been offered internships and full-time positions. I park my car in between two BMWs and walk inside. The dimly lit cocktail hour oozes class and sophistication. I recognize some of my accounting professors who are engaged in deep conversation with PwC partners. I find some students I know and we stand in a corner soaking it all in. Finally, we are asked to be seated. The Managing Partner of the local office stands up and gives a speech that still gives me chills. Today we welcome the new class of PwC. The future of our firm is yours. We will teach you, guide you and help you build your career. It will be difficult and challenging and we will always demand your best. Today you join a select community of the best and brightest minds in the business world. Working for one of the Big 4 was a truly remarkable experience. In many ways it felt like joining a fraternity. The connections I made within the firm are some of my best friends today and I cant even count the number of times that a door has been opened for me by a PwC alumni. It is with that gratitude in mind that I started Big4Guru.com. It is my passion to help accounting students and graduates feel that rush of excitement when they learn that they too have been hired by the Big 4. Below are the details of my eBook whichis a step-by-step guide to getting hired by the Big 4. The knowledge contained in this book comes from nearly 10 years in the industry, working for the Big 4 and studying their hiring practices. I've helped thousands of job candidates just like you land the job of their dreams! If you have any questions about the book please e-mail me at thebig4guru@gmail.com. Click the 'Add to Cart' button above or the 'Download Now' button below to access the eBook instantly. About the eBook - Big 4 Accounting Firms! The Bad News: Competition for these positions is extremely fierce: tens of thousands of candidates apply each year. Even if you are lucky enough to get an interview, you will be in store for the most difficult hiring process in the industry. You will face tricks and traps designed to weed out the majority of candidates. There is a reason for this: Working for the Big 4 is an amazing way for college grads to launch their career and professionals to re-launch their career on the fast track. The experience is that valuable. Don't believe us? Go to Monster or Craigslist and look at the qualifications for any upper level positions. Most likely you'll see "Big 4 public accounting experience required." Because of this, the Big 4 are the top job choices for nearly every accounting major. So what makes one person get hired over another? GPA? SATs? Extra-curriculars? While these count, they are not the answer. Sometimes the guy with the 4.0 gets passed over by the guy with a 3.0. Why is this? It all depends on how well you perform during the hiring process. Think about how much easier it would be and how much more confidence you would have! Here's the good news: we have done that for you! We have been in your shoes - wondering how we would ever stand out from the crowd, get an interview and get hired. We went to the campus career fairs, meet-and-greets, office visits and interviews. We stood out and joined the ranks of Big 4! Now we want to show you how you can too! Our book reveals all the secrets to getting hired by the Big 4.We have captured everything you need to know to get noticed and get hired by the Big 4 - from the resume to the acceptance letter and everything in between. We will take you behind the scenes of the Big 4 and put you on the fast track to getting hired! We'll share the horror stories of those who weren't so lucky and show you how you can avoid their mistakes. Why is getting hired with the Big 4 accounting firms so difficult? Big 4 recruiters are overwhelmed with resumes. They are trained to weed out potential candidates with a number of tricks and filters. Without properly understanding these, there is a very good chance that your resume will go right in the shredder. If you are serious about your career and want to land a job with the Big 4, you need an edge. You need to understand when and how you are being judged and the exact things that you can do and say to fly through the hiring process and avoid the pitfalls! We have taken our knowledge and boiled it down to a sure-fire process that will take you from getting your foot in the door to signing your acceptance letter. We will walk you through the process and expose all the secret tricks that the Big 4 will use against you. We will give you summaries and talking points to nail the difficult interview questions you will face. We will give you a crash course on what is happening right now in the accounting world so you will be ready to answer all the difficult interview questions. If you commit yourself to this process and master the techniques in the eBook, you will be on the fast track to getting hired. You wouldn't take a test without studying, so why not prepare for the job of your dreams. It will be like walking into an exam with the answer key in your pocket! The proper way to present yourself in an interview is to be both confident and humble. You may be the big man on campus, but in the world of the Big 4 you are competing with thousands of other students to become a small fish in a gigantic pond. Your resume may be impressive, your experience may be phenomenal, but when it comes to working with the Big 4 you have zero experience. The key is to present yourself as someone with the ability to learn. For you working for the Big 4 is as much about learning as it is getting paid. You know you dont know everything and you are not afraid to be honest about this. Sacrificing a shred of confidence for a pile of honesty will pay off every time. When you are dealing with the Big 4 it is OK to be nervous! Whether it is an interview or even an informal conversation at a meet-and-greet, it is perfectly acceptable that you may be nervous. These events are important and can have a huge impact on your future. Truth be told, there is a great deal riding on your performance. While this may scare you, it can also work in your favor. Showing some signs of being nervous can actually tell the Big 4 that you take this seriously and understand how important it is to do well. The Big 4 would place far more value on someone that seemed nervous than someone who was too bold or cocky. So, if you have an interview coming up, don't worry about being nervous. Just be yourself! "Big 4 Guru provided me with great insight into Big 4 accounting firms. After I bought his product, I was impressed when he sent me a personal email thanking me for my purchase. I had a question a few months down the line so I emailed he. He responded the next day and was very helpful. He really cares about helping accounting students! Great resource!" Download eBook Now to Get Hired at Big 4 Accounting Firms! To order 'Big 4 Guru's Book of Secrets - Big 4 Hiring Guide' eBook click the'Download Now' button below. You will be taken to PayPal where you can pay with your PayPal account or a credit card. Once payment is made the eBook will be e-mailed to you instantly. After you purchase the eBook, feel free to contact us at any time with questions about working for the Big 4. We are here for you!